Getting credit for your work is important for your career. You have put all that effort into your illustrations so don’t leave recognition to chance. There are a number of positive steps you can take to help your own career and supporting illustration as an industry. It’s metadata that may make or break our careers, and it’s getting ever more important as book sales automate and book data travels around the Internet. 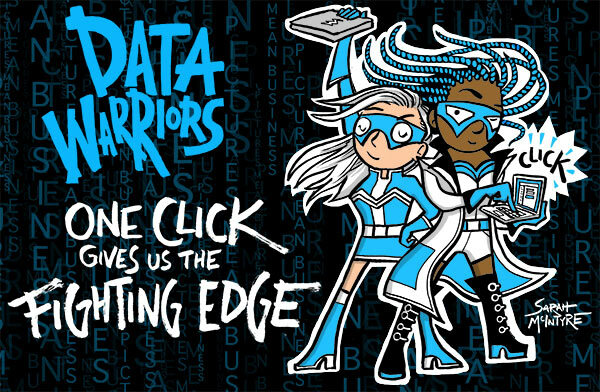 Did you know that information about books – ISBN, author, title, publisher, number of sales – is all collated by Nielsen, the book data provider? Nielsen can only provide the information publishers give them, so it’s crucial that your publisher includes you in that information. If you’re left out of awards lists or media mentions, very often it’s because you’re missing from the data. Your publisher also submits data to Amazon; if your name isn’t appearing there, it means your publishers didn’t include you in the data they provided. If you see something where you should be mentioned and you are not, politely contact the person responsible and ask. You can always refer them to this site if you want to. In most cases it is not deliberate, it may be that they were not told who illustrated the book. People generally want to support illustrators and are more than happy to help, so maintain a professional approach. Be vigilant about your contracts. Particularly illustrators of chapter books, get your publisher to commit in writing to putting your name on the front cover of the book. Don’t leave the decision to a last-minute whim of some marketing person. A phrase recommended by lawyer Nicola Solomon at the Society of Authors was ‘front cover credit with due prominence’. You can haggle over how big the lettering needs to be, but at least your name will be on the front cover. If the publisher doesn’t want to put your name on the cover for their own branding purposes, realise that this is a big deal. It’s going to affect YOUR brand, and the publisher should compensate you for this loss by paying you much more. Lack of a name of the cover may also affect whether you get invited to do paid events, and many illustrators depend on this second source of income. At the very least, you need your name on the title page if you want to claim Public Lending Right fees (PLR), another source of income. The Society of Authors can help you vet your contract if you don’t have a good agent. If a publishers refuses to credit you, ask yourself if the job is really worth it, or if you should turn it down. More positively, if a publisher does a great job crediting you, let your colleagues and fans know that this is a good publisher to work for. Publishers like to think they’re respected for being a vibrant hub of illustration. If your name is missing from Nielsen or Amazon data, contact your editor, or get your agent to contact your editor, and ask them to add your name. If you’ve asked and they haven’t done anything, speak with other illustrators and use the hashtag to highlight the issue. 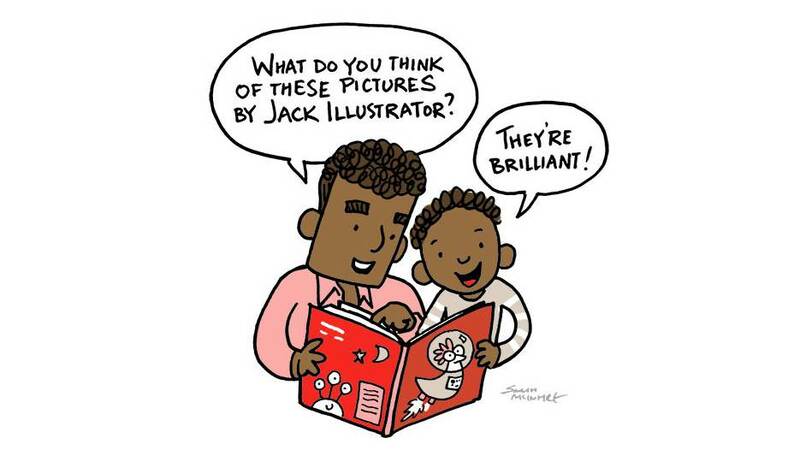 Sometimes it’s more effective to champion another illustrator’s cause than your own; keep this in mind, that if you’re there for other illustrators, there’s more chance they’ll be there for you when you need it. If your images get loose on the Internet, it will be easier for people to trace them to you. And then people who crop off your signatures are more obviously and intentionally doing something wrong. Publicists love Twitter, and if you’re not on it, you won’t realise just how often you’re getting left out of discussions, festival listings and promotion. In fact, you don’t ever need to write a single tweet, but DO set up an account; post a profile image so people can tell you apart from other people with your same name, and put a working link to your website in the short bio area. When people see you don’t tweet, they’ll click over to your website, which is where you wanted them in the first place. 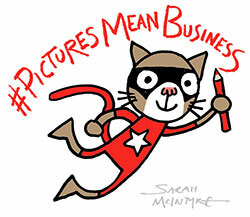 When you tweet about illustrators’ credit, use the hashtag #PicturesMeanBusiness. It helps raise our profile and people can click on it to find out more about the campaign. It’s useful online for pointing out where a missing credit is due, and discussing issues surrounding credit and data. It’s also helpful for pointing out where something’s done well, and these kind of tweets keep the campaign looking positive on balance. The exciting thing about this campaign is that if we really hone in on the issue of credit, this is one important issue that CAN be solved. But what we’ve learned while running the campaign is that we need publishers and writers to trust us; they need to feel confident they’re not supporting a campaign with some sort of mission creep that will eventually take away money from them. 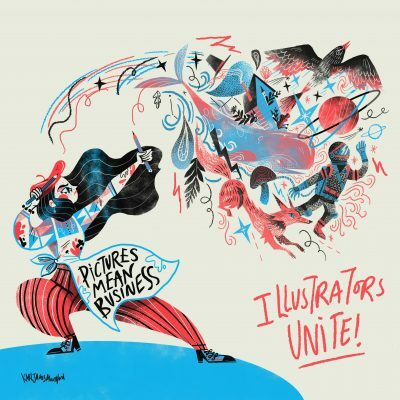 While it might seem obvious that issues such as fair illustrator pay, control over copyright, and art theft are essential for our business, our campaign message will be less clear and effective if we stray into that territory. In issues of pay, copyright, and theft, it’s not clear everyone wins, and often someone will lose money. But when illustrators are credited properly, no one loses anything. Illustrator pay, copyright, and theft of images ARE hugely important, and need addressed but they needs separate campaigns, with separate hashtags. 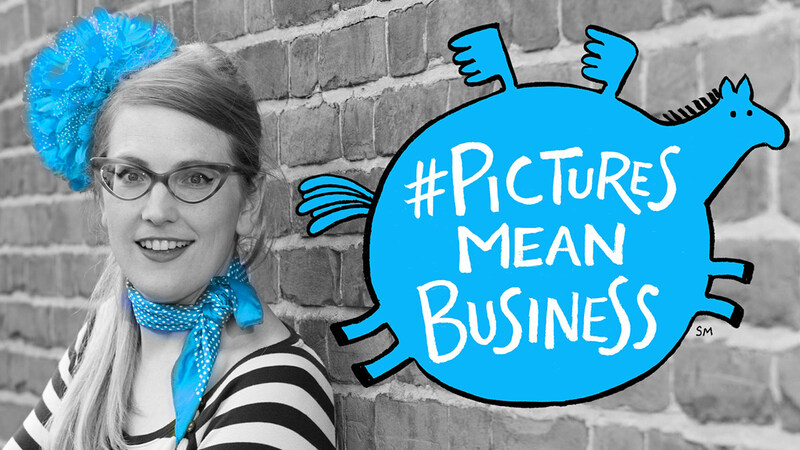 Read what Sarah McIntyre has to say about #PicturesMeanBusiness over on her site. The Society of Authors is a trade union for all types of writers, illustrators and literary translators, at all stages of their careers.